The pre-Baselworld releases have started to roll in and today we bring you the upcoming new addition to the Omega Speedmaster Collection – the Speedmaster Chronograph Moonphase Master Chronometer. The watch was first announced in January and we're taking a look at it for the first time here at HODINKEE. The new 44 mm stainless-steel Speedmaster Moonphase features a blue dial with a moon-phase aperture at 6 o’clock, and is further set with 12-hour register and date sub-dials at 3 and 9 o'clock, respectively. This new Speedy also has a brand new in-house movement, the caliber 9904, which is made of 368 components and builds on the earlier 9300 series. The moon phase is both a Master Co-Axial and Chronometer and therefore is certified as a Master Chronometer. Additionally, the watch is now METAS-certified (the Swiss Federal Institute of Metrology), which is a more thorough and intense certification than the COSC. 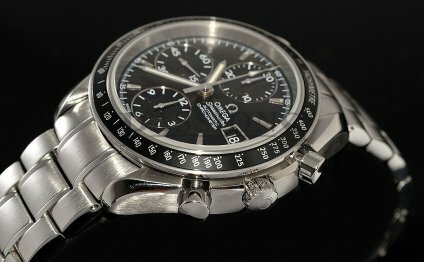 The first METAS-certified watch was the Omega Globemaster, which you can read more about here. The Omega Speedmaster Moonphase Master Chronometer Chronograph is a welcome addition to the Speedy collection and we're pretty excited to see this one in person in a few weeks. There have been many, many variations on the Speedmaster Professional since they first came out all the way back in 1957, but we think this one is really attractive. There's something about the combination of more classic, even dressy, details – like the moon-phase aperture and the sub-dial for the date, with its red-horn-tipped date hand, that just really works with the more utilitarian feel of the Speedmaster – a testimony perhaps to the strength of the original design. The retail price for the new Moonphase Master Chronometer Chronograph is CHF 9, 400. Be sure to check back here in March for hands-on photos and more information. A Digital-Analog clock is just the opposite of the old electric flip clocks from the ￢ﾀﾘ70s. Those clocks displayed time digitally, but did it mechanically.